Unique ice lumps scatter across Japanese shores. 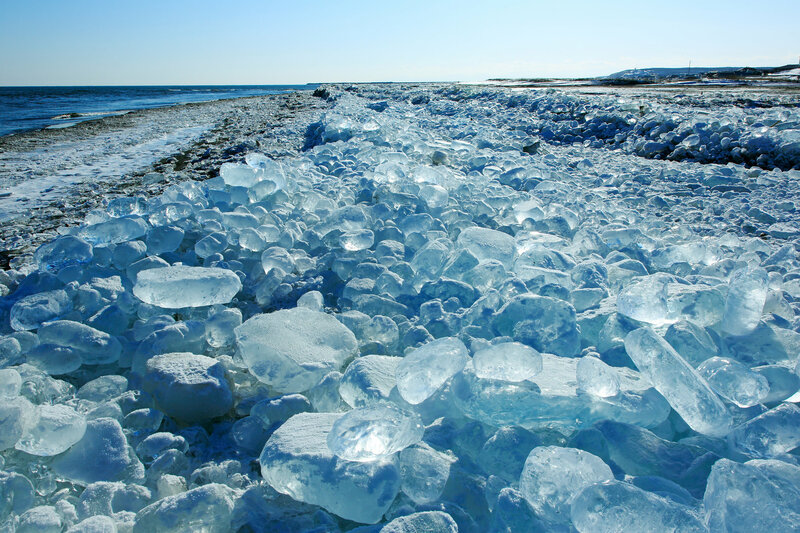 They are known as jewelry ice, appearing every winter on a beach at the mouth of the Tokachi River on Hokkaido, the northern island of Japan. The best time to see jewelry ice in Japan is in January or February. The ice lumps appear every winter at the mouth of the Tokachi River on Hokkaido, the northern island of Japan and shine like diamonds when the sun or the moon is upon a clear sky. Every winter, this magical phenomenon appears on the Hokkaido Island as the mouth of the river frozen causing chunks of ice to crack and float to Japan’s shores. It is a unique natural phenomenon and it impresses with the color changing of the ice according to the light and the part of the day you see them. For example, in the morning or at sundown the ice will be orange, during the day, it’s blue and can also appear sapphire, topaz or opal, depending on the sky. Impressive! The unique thing about this ice is the property to be so transparent as the river water is never this clean. Tourists can see the ice jewels every year from the beginning of January until mid-February, so do no hesitate, buy a ticket and go see the glistening gems lying all over the Hokkaido Island! Frozen Fox Found In A Block Of Ice!